One of the biggest reasons that soccer is popular not only with players but with parents is that unlike many other sports, you do not need much equipment to participate. Shirt, shorts, socks, shin guards and shoes are all that is required. But many soccer players and parents struggle to find the right shoes . Most sporting goods stores and websites feature hundreds of different kinds of shoes for soccer. It can quickly become mind-boggling. What this article will do is show you a few of the best pairs of soccer shoes on the market as well as give you some guidelines for what to look for when making your purchase. Our top choice for a soccer shoe is a reliable old standby for soccer players since 1950. The adidas Samba shoe has transformed from being a shoe made for training on icy practice ground to being a mainstay for indoor soccer play as well as stylish, selling 35 million pairs in its 65-plus year journey. A lot of that long-standing popularity comes from its simplicity. It has always been made from soft, supple leather that provides comfort and a good, long-lasting fit. Its gum-rubber outsole provides great grip and control on solid surfaces. The Samba serves not only as a great soccer shoe, but is also a vanguard of style. The simple two-tone design and classic stitching makes for something stylish that many wear as a fashion accessory. The sleek and classic styling aside, the Samba is also just a great soccer shoe that has maintained its reputation primarily by not messing with a good thing. The control offered by the non-slip sole allows you to keep your feet in the face of any move thrown at you. The support provided by the inner cushioning and leather upper makes for a comfortable shoe that will hold up for quite a long time. Another item high on the list of many reviewers is its relatively low cost for such a versatile, stylish shoe. 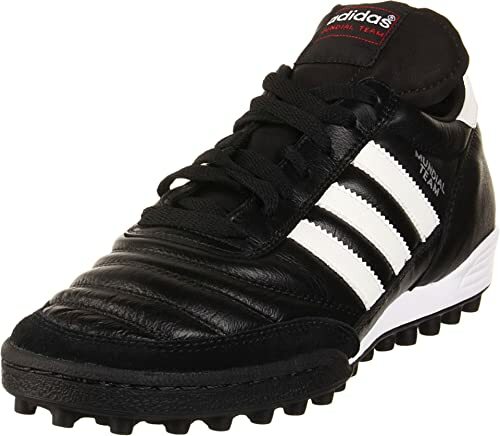 Compared to many soccer shoes, you would be surprised to see that its price comes in only around forty to sixty dollars. Which is why these shoes not only are a great pair of shoes for a fallback, but also why many people also just wear them when they are not playing soccer. By being the same shoe for 65 years, the Samba has become fashionable in and of itself. Between that and its low cost, they will likely never go out of style. One thing that those familiar with adidas Samba series did notice is that there are several different iterations of the shoe, with the Classic being a flat insole that offers no arch support, like the originals shoes. While the Classic-M has an arch support that those who played soccer in these shoes appreciated, but many casual wearers found strange to adjust to. While many would expect that a shoe this economical would give up something on its durability, but many parents have sung the praises about how well these shoes hold up to everything their children can dish out on them. Knowing how hard children can be on everything of theirs, it is a great endorsement that of these shoes that they are built to last. The largest concern of note has to do with the fit of the shoe. Many reported that the shoe tends to fit narrowly, especially around the toes and might feel too snug when first worn by people with wider feet. Even then, many people who reported this snugness mentioned that these shoes were more than comfortable after being worn a few days. Many people recommended wearing these shoes for a little while either casually or at practice before using them in a game . For as long as the Samba model has been around, there are many assumptions that could be made about it. That these shoes are simple, attributed to adidas’ initial commitment to making a high-quality, but affordable shoe. They have a clean, stylish look, which is a result of that simple design. But these shoes are more than a fashion item or a soccer shoe. It is clearly both and on either facet alone it would make for a great soccer shoe in our opinion. Coupled with price, it is our pick for the best soccer shoe on the market. Another shoe geared towards indoor soccer and futsal holds our second slot. The Kelme Star 360 Michelin is the result of a joint effort of Kelme and Michelin Rubber to make a shoe that gives unparalleled control and feel, especially for futsal, which requires a lot of grip both on the floor and the ball. The first noticeable feature of the Star 360 is that is wider than the typical soccer shoe. This tends to provide more loft behind your kicks or give them the ability to skip a little more rather than bounce. For those playing on harder, especially indoor surfaces this is sometime preferable as the ground does not absorb much energy tending to make passes and volleys bounce higher. Some users who switched from other shoes reported that this took a little getting used to in order to control passing again, but almost everyone was pleased with what this feature provided them. The Michelin rubber sole on these shoes is patented and exclusive to Kelme. Many reviewers were impressed with their almost peerless grip on artificial turf or a futsal court. The sole contributes to a shoe that is light overall but provides great support and feel, making for an impressive and high-level feel to this shoe. An issue that Kelme addresses even on their company sale page for this shoe though is an important one. The sizing on this shoe is about a half to whole size larger than similarly sized shoes. Most buyers reported that going down a half size for this purchase gave them almost a perfect fit. Compared to the Samba and many other soccer shoes on the market, the Star 360s were recommended for the player who find themselves usually between sizes as most reported that the Kelme models tended to fit and feel better than the typical shoe for them. Again, the mention of the materials used and feel of these shoes would give the expectation that these shoes would be on the expensive side. Surprisingly, they were not far off of the price of the Samba and are easily a great value even before you factor in their durability. Most people who claimed they played regularly tended to find that the shoes tended to lose their rigidity and support after a little over a year, but at their price, many replaced their worn pair with a new pair of Star 360s. This shoe may not be the fashion plate that the Samba is, but Kelme offers the Star 360 in a variety of color combinations that allow you to find a pair that fits your color preference and flair. If you need shoes that stand out or in colors that match your team’s colors, these shoes offer a variety of options that make it easy to find a scheme that you like. Where there is a slight drawback is in this shoe’s versatility. Clearly made for indoor play and futsal means that you really cannot get away with these shoes on a harder field if needed. 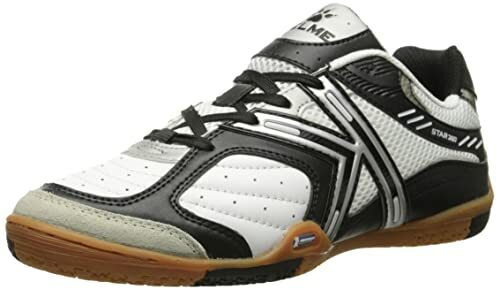 Even then, if you are looking for a great indoor soccer shoe the Kelme Star 360 is a great way to go. While a little more expensive than the Samba and the Kelme Star 360, the adidas Performance Mundial Team Turf Soccer Cleat is a shoe well suited for players who play on field turf or harder outdoor surfaces. It of course has the same quality, economy and durability associated with the Samba and adidas, but the Mundial model offers a shoe suited to a different aspect of soccer. Unlike many shoes made for turf and hard ground, the Mundial is a light shoe with a fairly flexible sole. It’s soft leather outer shoe and molded inner sole contribute to a feeling of responsiveness from this shoe that provides the traction you want on harder surfaces as well as the control of the ball that a lighter shoe gives. This can also be attributed to its kangaroo leather outer shoe and polyurethane internal support providing light, yet durable materials in its construction. Something else that is atypical of many shoes on the market is the Mundial’s thicker inner sole. Many soccer shoes have a flatter sole, which lowers weight. By going with lighter materials, the wedge sole on this shoe provides more heel and ankle support, which makes this a shoe great for goaltenders, referees, coaches or those potentially recovering from injuries to their foot or heel. Comfort was given high marks by many reviewers for this shoe and their fit and feel made for a shoe that not only the players loved, but many coaches and referees liked because they could be worn for long stretches of time without any problems. This shoe received high marks as a shoe for the practice field as it was able to handle the typically harder surfaces resiliently and with little blistering or other foot pain. Those shorter cleats are also idea for harder surfaces as they do not dig into the grass deeply. This prevents the dreaded feeling of playing on stilts or skates that can sometimes occur with longer cleats. The cleats on the Mundial are reported to maintain their shape and sturdiness for a long time, but do tend to mark hard court surfaces, so they are not as ideal for general use. Like mentioned earlier though, these shoes are a little more expensive than the other shoes featured here, coming in around ninety to one hundred dollars. Even then many reviewers reported that their Mundials held up through a significant amount of usage, making for a good return on investment in these shoes. Another factor to consider in these shoes is that they are better suited to the established player, one who would play enough to justify this much spending. Still, compared to many other shoes on the market, adidas’ reputation for high-quality with a price that is easier on your wallet carries true in these shoes as well. Another concerned is its leather tends to absorb water rather easily which can lead quickly to shrinking. Meaning that waterproofing would be a great idea if you tend to play outdoors regularly, especially in rain or even mud. Another issue reported by some users was that the arch support was minimal compared to many shoes, but in general, the classic design, including the flatter sole were given high marks. Those concerns aside, the adidas Performance Mundial Team Turf Cleat would be a great shoe for most outdoor use considering its cleats catered to more general use and its durability and quality. With their more specialized usage and higher price, they are as strongly recommended as the Samba or Star 360, but still a strong soccer shoe in its own right. An ideal shoe for outdoor soccer and most artificial fields, the Fila Forza III RB Soccer Shoe is a great choice for those shopping on a budget. The Forza III RB is a decent soccer shoe that can handle every field type and weather condition thrown at it. The main point of preference on these shoes for most buyers were that they were cheap, selling for twenty-five dollars through most Amazon sellers which compared to many other shoes on the market can be considered a breath of fresh air after seeing prices of sixty, ninety or more. Where the price difference comes in for the Forza III RB to the other shoes we cover in this article comes is in the materials used. Fila constructed this shoe out of synthetic leather and the cleats are plastic making for a slightly heavier, less durable shoe. Even then, these shoes are ideal for parents looking for a cheaper shoe and since dealing with growing children, are not as worried about shoes that will last for more than a season. There are some trade-offs going with this shoe compared to many others. Like mentioned above it is a little heavier and not as durable as some more expensive soccer shoes. These are things that a very serious and even some casual players would notice, but these shoes will do their job, but they are also just simply put, soccer shoes. Even then, these soccer shoes have the quality that is attributed to Fila and there were no reports of any major concerns compared to many other lower-end shoes on the market. While paying more would give shoes robust with features, bells and whistles, just by being adequate for their task is great in and of itself. 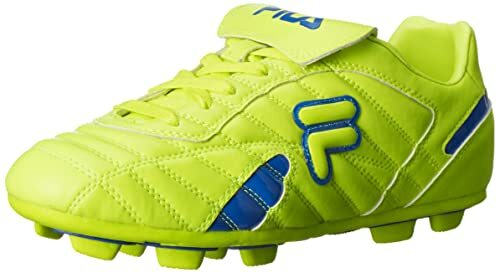 For those shopping for soccer shoes on a budget though, whether parents or just playing occasionally, the best bet to provide the most bang for your buck is the Fila Forza III RB. Without any glaring flaws and its general reports of being a solid, comfortable shoe, this shoe is our budget pick. One criteria that will make your search for the right soccer shoes a lot simpler would be what conditions you are playing in. Different conditions have differing optimal configurations. If you are playing on grass, you will definitely want cleats. If that grass is wet, you might want to look at shoes made from synthetic leather as they will not stretch when wet. If you are playing an artificial surface, whether indoors or outdoors, you may want a shoe that has shorter or no cleats at all. Cleat length and cleats can be very important as traction and safety can be affected by the choice. Some higher-end shoes have detachable cleats which can be changed out depending on the conditions. Most casual players will have a pair for indoor soccer and another with an average cleat length to be best equipped for the most conditions. While considerations are slightly different, like with any shoe, fit is of utmost importance. Another important consideration for soccer shoes is how the shoe fits. You will want to make sure that the shoe fits snugly on your foot without rubbing or causing friction anywhere on your foot. A shoe that is too loose will cause problems getting a true touch on the ball. A shoe that is too tight will cause discomfort and lead to pain. Parents need to accept that fit is more important than something with room to grow. While for the most part, outfield positions will have the essentially the same needs, the position played can make a difference in your choice of soccer shoe. Obviously, goaltenders wants something with more ankle support for lateral movement. Most field positions will have the same general need, but if a player does more shooting or free kicks, they may want a shoe with a particular vamping pattern. Vamping is a pattern placed on the surface of the boot which can create more power or give the ball more spin depending on how it is struck. While vamping is something that more advanced players are better equipped to take advantage, knowing that differences in even the stitching can affect what happens when you strike the ball can make one shoe more preferable over another. Even though this was talked about in our first pre-purchase consideration, a little more focus should be given to cleats. While it was mentioned above that some shoes offer the option of detachable cleats, explaining the differences in cleat length and composition can give a better understanding of soccer shoes in general. The first aspect with cleats is their composition. While a well-groomed, properly watered field will require longer, more solid cleats for the best traction, many lower-level players and almost all North American players will not have that luxury and will be better served with a shorter cleat. Those cleats, considered either hard ground or multiground, tend to be shorter and a better able to deal with a harder, drier surface. Usually there will be a large number of cleats on the bottom of the shoe as that will provide a better grip and contact with the surface. Players on artificial surfaces will usually want an even shorter cleat, similar to a running shoe to provide durability and traction when faced with the hard and plastic surfaces that field turf and other forms of artificial grass create. Along with this, there are shoes made for indoor play, whether with traditional astroturf or a futsal surface, have shoes that are similar in sole construction to a basketball shoes that prevent slipping and do not tear up or mark the playing surface. As mentioned above, most players will likely have a pair of soccer shoes for outdoor use, likely have two pairs of shoes, a set or cleats for outdoor use and another pair of shoes for when they play indoors. While detachable cleats are an option, most shoes offering that option are made for outdoor use only. Therefore it is likely that you can expect to need a separate pair of shoes for indoor play regardless of what choice you make for cleats. While shoe shopping of any sort can be daunting and confusing, a little knowledge beforehand on what to consider can make it that much easier to find the right soccer shoe for you. Knowing what sort of conditions you will be playing as well as your position can be coupled with the comfort of a good fit and make footwear a benefit rather than a detriment to your game.